Hi and welcome to my tutorial on Newton’s second law of motion. My video on Newton’s second law explains how we can use the law to predict the forces required to control the acceleration of an object. In this tutorial I will discuss the content of the video, with further comments, observations and examples which will help you to better understand the law. I have now released an ebook which explains Newton’s second law of motion in five easy to understand steps. It is available in two versions; one for the iPhone and iPod touch and one for the iPad. The ebook contains over eleven minutes of animation, a range of images, and questions with solutions so that you may check your understanding. If you are interested in obtaining a copy, please follow the links below to the iBookstore where you may download a free sample or buy the full ebook. You can also see a video of the contents of the ebook here. Newton’s second law of motion is one of three laws published by Sir Isaac Newton in 1687. The laws explain the interaction of forces and objects and the way in which the motion of an object is affected by force. You! Yes you are an object and the second law of motion applies to you just as it does any other object with mass. An object of mass m subject to an unbalanced force F will have an acceleration a in the direction of the force. For a given mass the acceleration of the object will be larger for a larger unbalanced force. To achieve a given acceleration the force required will be larger for an object with more mass. This is represented mathematically in the form Force equals mass times acceleration, that is F=ma. Engineers use the laws of motion to design the items we use every day. For example, when we get in a car and accelerate along the road, the size of the engine required to achieve the acceleration has been calculated using Newton’s second law of motion. As a result of the calculation, we get a car with just the right level of acceleration and with the right size of engine to give the acceleration whilst maximising the fuel economy. 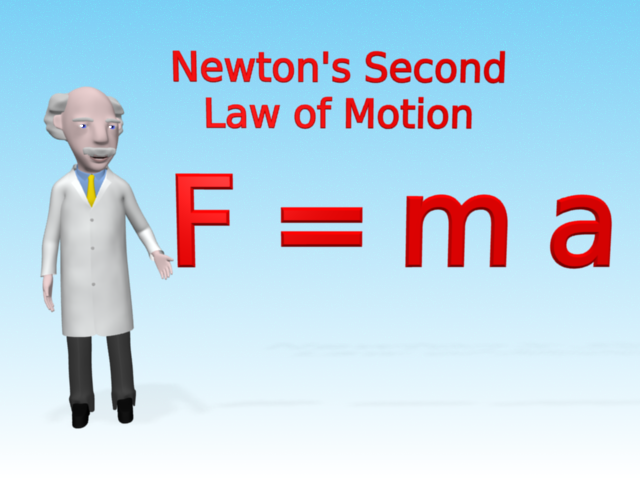 Newton’s second law F=ma enables us to calculate the force F required to accelerate an object of mass m with an acceleration a. We can also re-arrange the equation into the form F/m=a. This enables us to calculate the acceleration a of an object of mass m subjected to a force F.
Now you should note that F=ma is in fact derived from the more exact definition of the second law which is that the Force equals the rate of change of momentum of the object, where momentum is defined as the object’s mass times its velocity. However, in this tutorial we will study the law in the form F=ma. 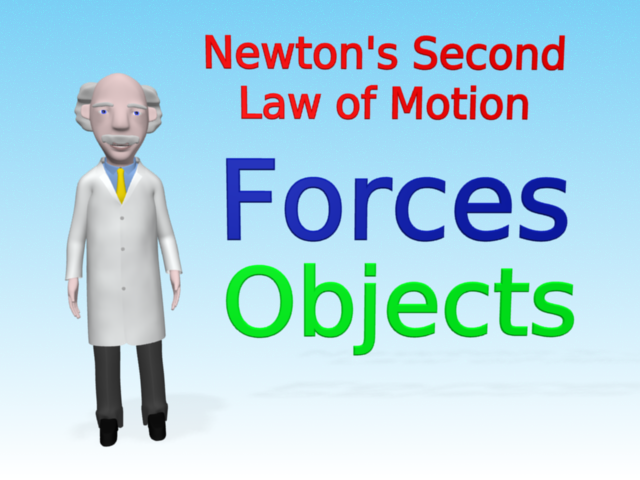 An important point to note about the second law is that the force F refers to the sum of the forces on the object in a given direction. If the forces are in balance in any given direction then the sum of the forces on the object in that direction are zero. 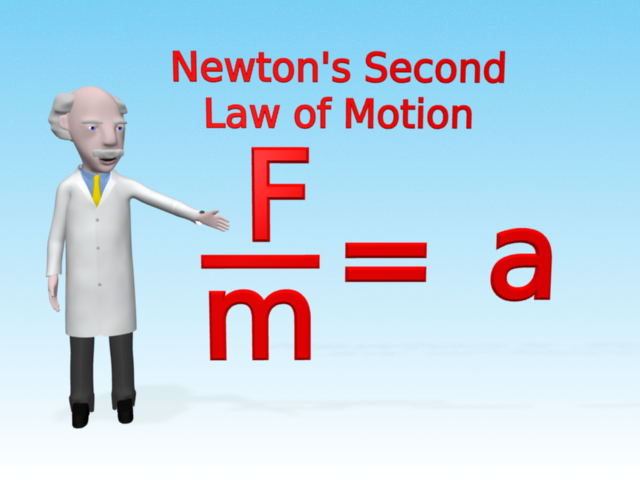 Using Newton’s second law in the form F/m=a tells us that if the sum of the forces are zero then the acceleration must be zero. 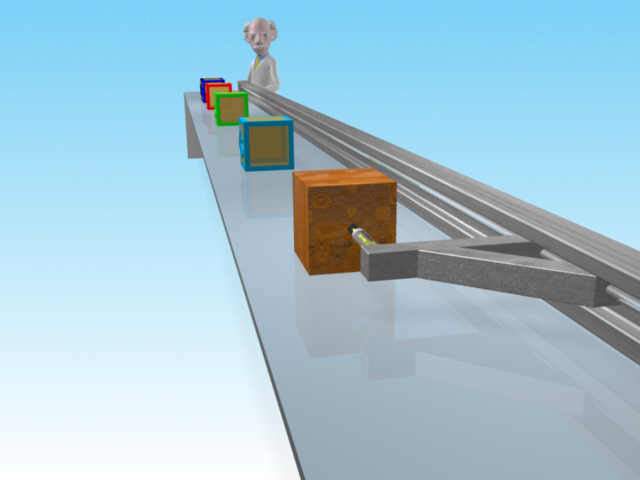 I illustrate this in the video with an analysis of the vertical forces on a block which is stationary on the surface. 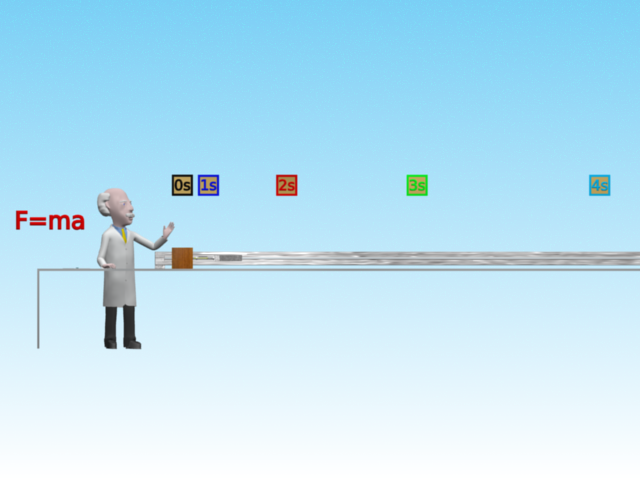 So what about doing some experiments to to demonstrate the second law. I do this by using a block of wood as the object and a surface which is so smooth that we may assume that it provides no resistance to the block moving on it. We refer to this type of surface as a frictionless surface; that is a surface with no friction. In the real world all surfaces have some friction. 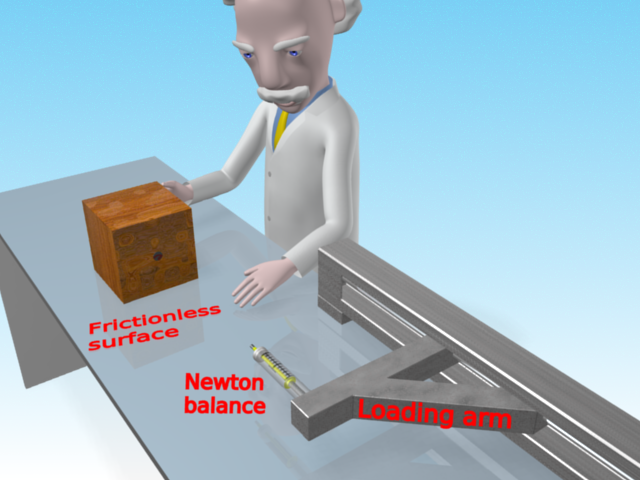 However in my virtual laboratory I can create ideal surfaces like the one shown below, which has no friction, so that we may conduct experiments under ideal conditions. 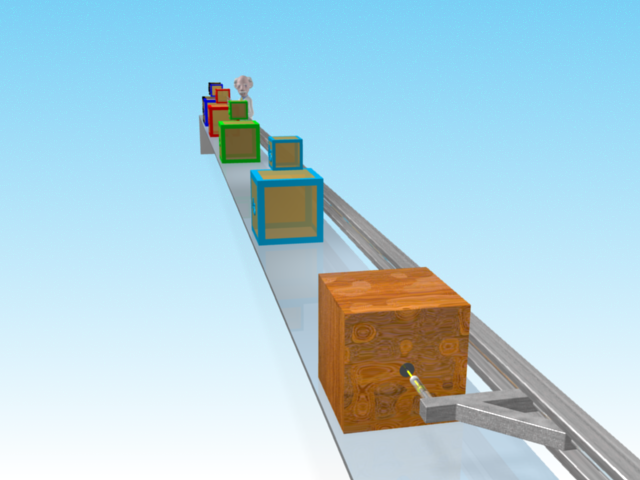 I use a loading arm to apply a constant force to the block as it moves along the surface. The force being applied to the block is measured by a Newton spring balance. This uses a spring which has been calibrated to read force in Newtons. In the picture below you can see the force being applied to my hand (indicated by the red arrow) as the loading arm moves to the right. 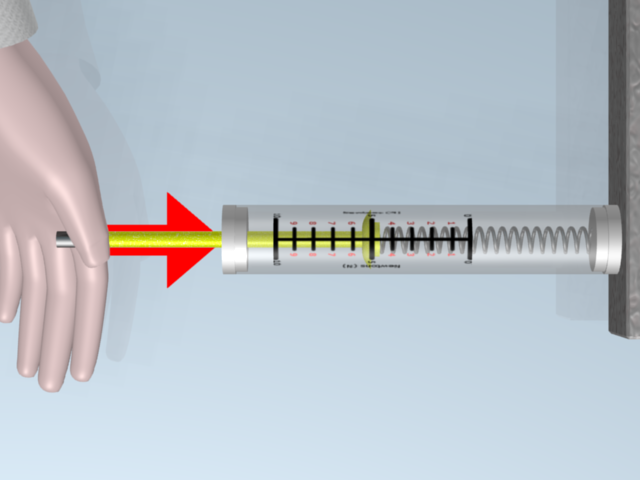 By resisting the motion of the loading arm (by holding the yellow piston of the Newton balance) the spring in the Newton balance extends and the scale on the Newton balance indicates the force being applied to my hand. The larger the extension of the spring, the larger the force. The first experiment I conduct involves applying a horizontal force of 2.5 Newtons to a small block which has a mass of 5 kg. To give a visual indication of the acceleration of the block as it moves along the surface I take a snap-shot of the position of the block at one second intervals. After the experiment the snap-shots are moved above the surface to enable us to examine the change in position of the block during the experiment. As you can see, the distance between the snap-shots increases. This means that the velocity of the block is increasing, which means that the block is accelerating under the action of the force. The next experiment involves applying double the level of horizontal force to the small 5 kg block. 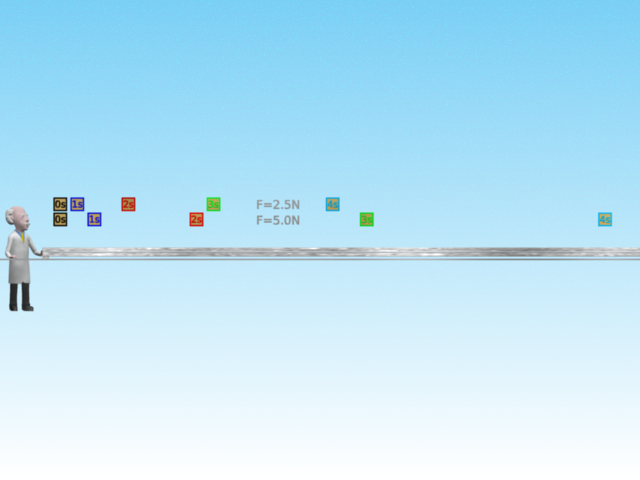 After the experiment you can see from the snap-shots how the block has moved a further distance for each second under the action of the larger 5 Newton force. This is a result of the larger force increasing the acceleration of the block. By using Newton’s second law you can calculate that by doubling the size of the force you double the resulting acceleration for an object of the same mass. Finally I conduct an experiment with a block which has a mass ten times that of the small block. I calculate from Newton’s second law that this will require a force ten times larger to achieve the same acceleration. You can see that when I apply a force of 50 Newtons to the large 50 kg block it has the same acceleration as the small 5 kg block with a force of 5 Newtons applied. An object of mass m subject to an unbalanced force F will have an acceleration a in the direction of the force. We noted that the force is the sum of the forces on an object in a given direction. If this equals zero then the acceleration of the object is zero. We also observed that if we have an unbalanced force applied to the object it will accelerate. The larger the unbalanced force, the greater the acceleration, and for objects with larger mass, we need to apply a larger unbalanced force to get the same acceleration. A car: When a car accelerates gently along the road you now know that this is because there is a force accelerating it . This force is generated by the engine. When the engine is used to apply a larger force then you see the car has a larger acceleration. Now what if you were an engineer designing a new car and you had to specify the force that the engine has to generate to accelerate the car. Assume that the new car is 10% lighter than the previous version of the car and has to have the same acceleration. You can apply Newton’s second law to the problem and calculate the force you require from the engine in the lighter car. You know that the mass of the car is 90% of the previous version (since it is 10% lighter). Newton’s second law therefore tells you that for the same acceleration, the force generated by the engine needs to be 90% of that of the engine used in the previous version of the car. In practice this means you can use a smaller engine, which will in general be more fuel efficient and therefore the new car will be more environmentally friendly. So you have just used Newton’s second law to help save the environment! A lift: When a lift starts to move vertically upwards it has to start accelerating to increase the velocity of the lift and its occupants. You now know that Newton’s second law tells you that if there is one person in the lift the force required to accelerate the lift is much smaller than if there are ten people in the lift. Now the motor used to operate the lift will have a maximum force it can generate. If you were the engineer designing the lift you would therefore need to calculate the maximum mass that can be in the lift to maintain a reasonable level of acceleration. You would therefore use Newton’s second law of motion to calculate the maximum number of people that may be in the lift at one time (you would need to make an assumption about the mass of a typical person). So the next time you are in a lift, have a look around for the notice that states the maximum number of people which can be in the lift. You now know how it is calculated. You are an object: As an object you are subjected to forces, and as a result you are subjected to various levels of acceleration. You can feel this, for example, when you are in a car. When the car accelerates you accelerate along with it and therefore the seat in the car is applying a force to you to get you to accelerate. The larger the acceleration the larger the force applied to you. Next time you are in a car think about the forces you are experiencing and see if you can relate this to the acceleration of the car. Well, I hope you’ve enjoyed my tutorial on Newton’s second law of motion. Please post any questions and comments you may have. Below is a link to my video on the second law. Once you start playing the video you may view it in high definition and full screen by using the options at the bottom right of the video player. Previous story What a big block! Yes D, I am currently making a video on Archimedes Principle. You can see the models I’m developing for this video on my YouTube channel. This is useful as well as practically explained. I liked it so much. Thanks to Professor Mac. Thanks for your feedback Rivul. Thanks Mac. This was very helpful. In your future videos, could you include real-world examples as well? Thanks Chuck. 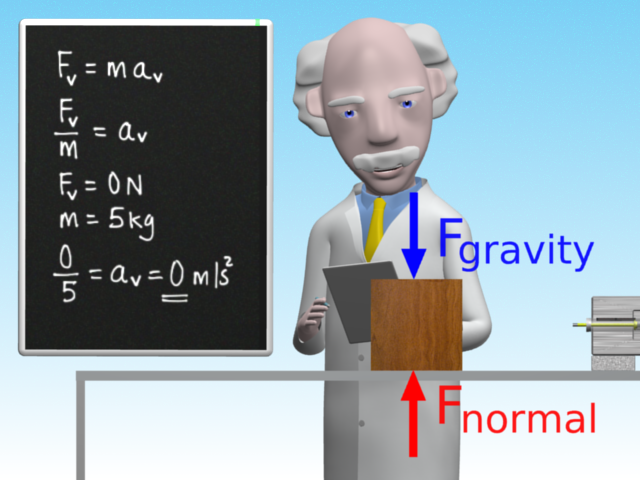 Yes I will be including real world examples in my new video which explains gravity. I am close to getting it ready for release. Very Interesting Mac. Thanks a lot Mac for this video.But what about the third law Mac? I’m interested to see the video of it. Thanks Renee. I am preparing the video for the third law now for release early 2013. Your tutorial has helped me to understand the laws of motion very well. However, I have a slight problem in solving numericals related to newton’s first law of motion….I would therefore request u to add more tutorials with solved numericals. Thanks for your comments. I add examples of calculations where they help to explain the law. I will keep in mind your request in my future videos. about the tutorial are not enough try to put other which are more difficult. Thanks for your comment. 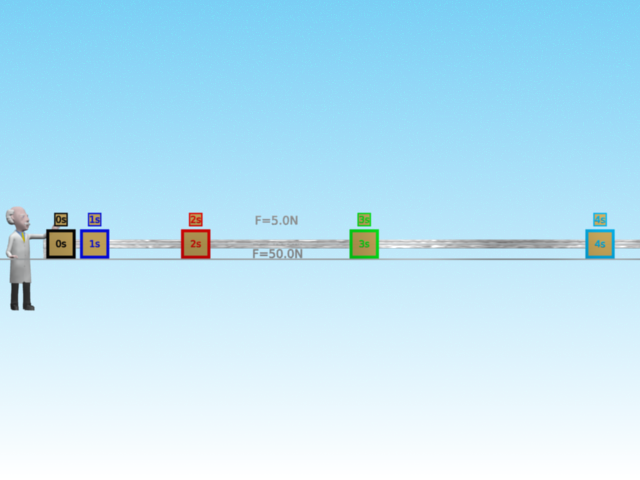 This tutorial is designed to help students who wish to understand the concept before they move on to more advanced application of the second law. In the future I will be adding more advanced tutorials. Thanks for your feedback. I will be making a video on the third law in the future. For now you should have a look at some of the other videos available on YouTube explaining the third law. The third law is fairly simple in form but can be difficult to apply. It simply states that if you apply a force on another object that object applies an equal force on you in the opposite direction. I assume you are currently sitting down in front of a computer. You are pushing down on the chair due to the gravity force of your weight and the chair is pushing back on you in the upwards direction with a force exactly equal to your gravity force. This is the third law. I used this video every year in my class. Thanks for your feedback Lou. Good luck to your students in their studies. thank you so much professor Mac…your lectures are helping to understand more….